Amazon's Prime Day event is in full swing now and lots of interesting technology deals are showing up. We've already covered some big discounts on Amazon hardware, as well as a number of phones, tablets, and Chromebooks. Now we've noticed another good deal, this time for the NVIDIA SHIELD TV, which can be had by Prime subscribers for as little as £179.99. 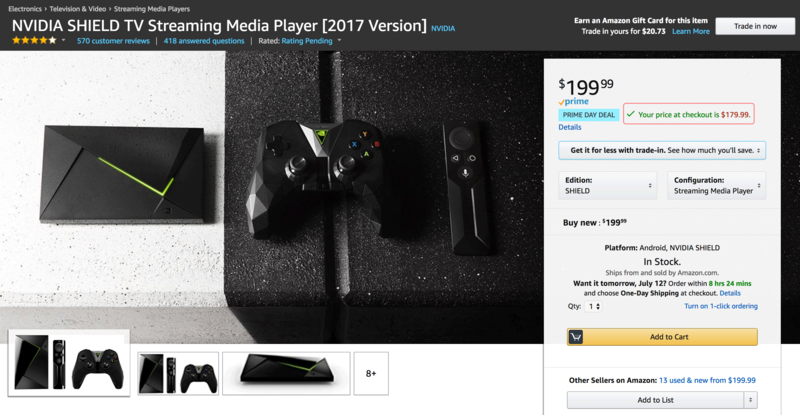 For your money, you'll be getting a 2017 version of the SHIELD TV, which comes with a remote and the redesigned SHIELD controller. The Android TV box comes with Nougat 7.0 and offers you access to all your favorite TV and music services, plus plenty of Android games and even some SHIELD exclusives. Both the controller and remote have the convenience of voice control, a much faster way to get to all of your content. This is a Prime Day only deal, which means it'll expire at 11:59 p.m (PT) today. There won't be unlimited stock, either, so I'd get in quick if you don't want to miss out.